Civic Center Plaza was once again packed with throngs of protesters this weekend. 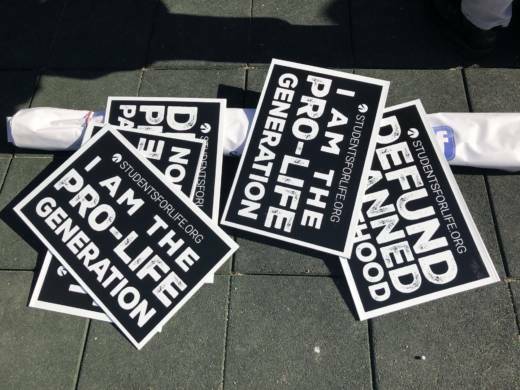 But this time, instead of pink hats and feminist slogans, there were signs declaring "Choose Life and "Defund Planned Parenthood." 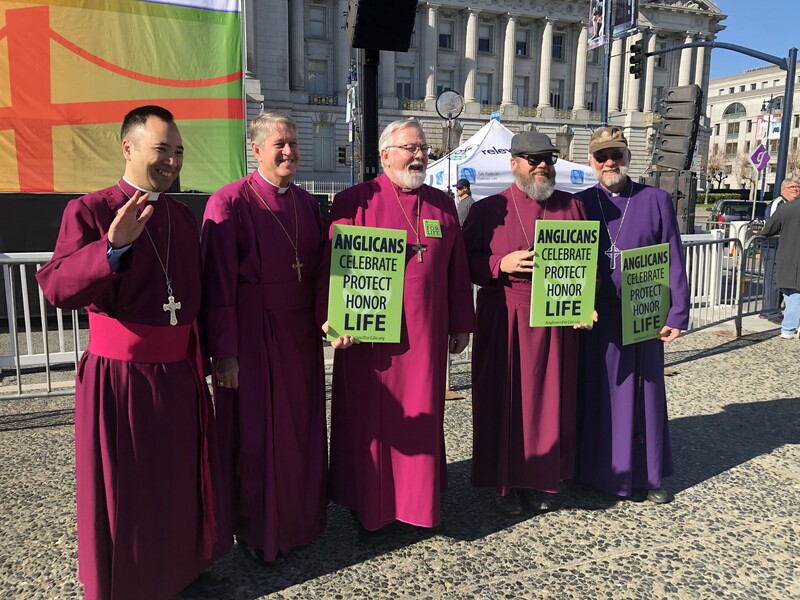 The protesters were gathered for the 14th annual Walk for Life West Coast, held each year in San Francisco with the goal of ending legal abortion. Police didn't provide a crowd count for today's march, but organizers expected some 50,000 participants. They followed the same route -- starting at Civic Center Plaza, down Market Street to Justin Herman Plaza -- as the organizer-estimated 65,000 who attended the San Francisco Women's March last weekend. 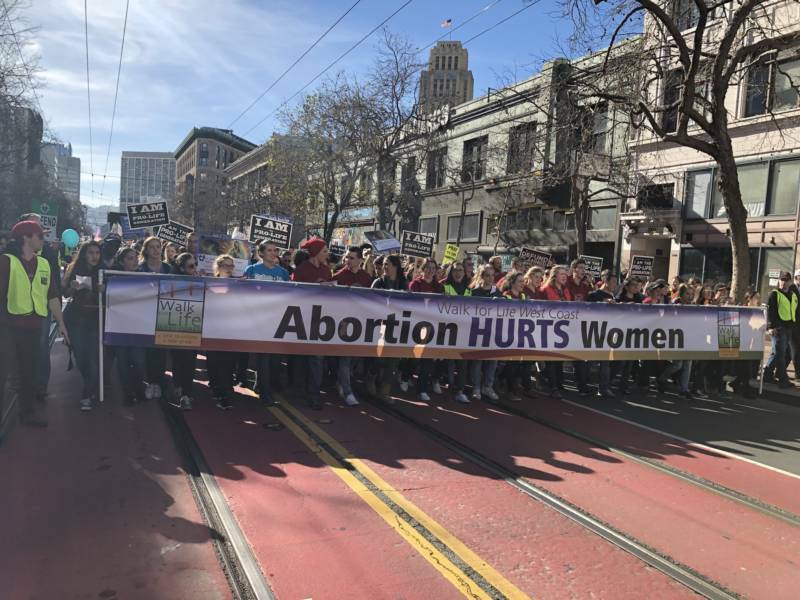 The Walk for Life event regularly follows the anniversary of the 1973 U.S. Supreme Court Roe v. Wade decision, which affirmed a woman's right to have an abortion. Many of the marchers came via chartered buses, sponsored by religious organizations from outside of the Bay Area. Representatives of the Anglican Church in America came from as far away as Atlanta. 81-year-old Salvador Rodriguez travelled from the Central Valley town of Sanger to be at the march. Rodriguez said he has been at every Walk for Life West Coast going back to 2005. At one point the San Francisco marchers were met by several hundred counter-demonstrators, but there was no violence. The past year has had some positive moments for the anti-abortion movement including the inauguration of Republican President Donald Trump. Earlier this month, Trump became the first sitting president to address the annual March for Life in Washington, doing so via a live video feed. The movement also saw the conservative Neil Gorsuch confirmed to the Supreme Court. Despite these successes, Walk for Life West Coast co-founder Eva Muntean recommitted the activists to their mission.